The frigate “Santa Maria” has arrived this Sunday at the Naval Base of Rota, ending its integration in the NATO Permanent Grouping No. 2. 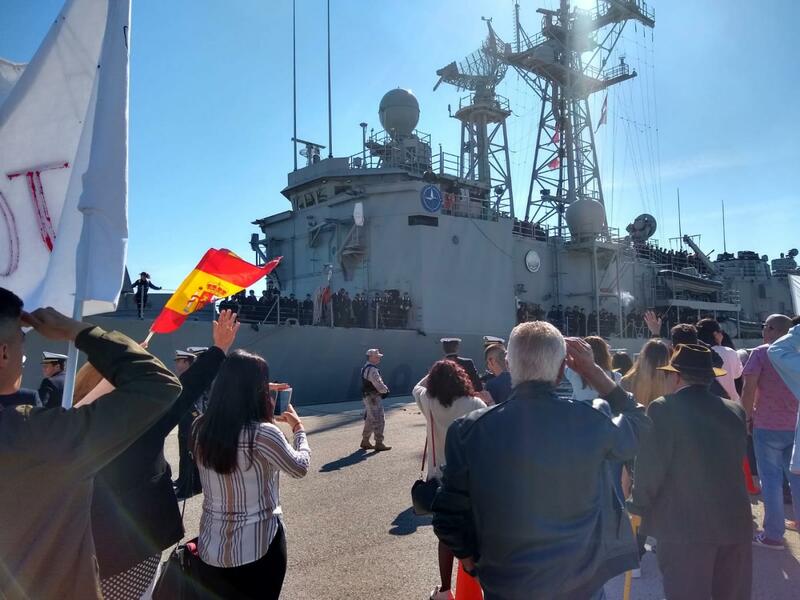 The frigate “Santa María” arrived on Sunday at the Rota Naval Base, ending its integration in the NATO Permanent Grouping No. 2 (SNMG-2 in its acronym in English). This integration began on April 3 in the Port of Odessa, Ukraine. The Grouping has been under the command of the Dutch Commodore Boudewijn Boots, aboard his flagship the “HNLMS Evertsen”. The group has made a total of four patrols throughout the Central, Eastern and Black Seas, in addition to various collaborations and exercises with the Turkish, Hellenic and Ukrainian allied marines. In addition to the “Santa María”, the Canadian “HMCS Toronto” and Turkish “TGC Gelibolu” frigates and the French combat supply vessel “FS Var” have composed the SNMG-2. The ship has developed an intense activity, carrying on board an SH-60B helicopter and an Operation Security Team (EOS) of Marine Infantry, which supported the visit and registration of the frigate. In summary, 80 days after leaving the national territory, the “Santa Maria” arrives at the Naval Base of Rota this Sunday with more than 15,800 nautical miles, and having visited the ports of Souda (Greece), Antalya (Turkey), Piraeus (Greece), Catania (Italy), the Naval Base of Aksaz (Turkey), Odesa (Ukraine) and Civitavecchia (Italy).